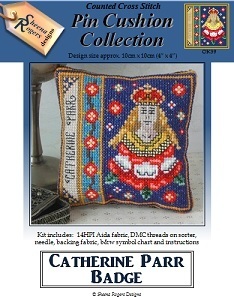 This pincushion design features the Badge of Catherine Parr, the sixth wife of King Henry VIII. The emblem shows a crowned maiden's head rising from a Tudor Rose and is a symbol of youth, freshness and innocence. Catherine used her patron saint, St Catherine of Alexandria, as inspiration for her badge, and the maidenhead has long been associated with the Parr family badge and coat of arms. The design also includes a border of Tudor roses set against a deep Turquoise background, with Catherine's name down the left hand edge, all framed with rich gold and sapphire blue threads. Design size approx. 10cm (4") square.